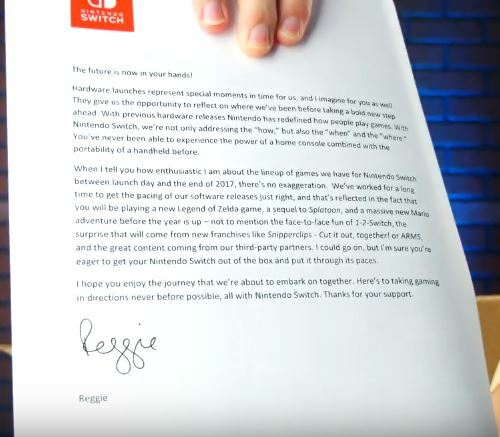 It seems that press copies of the Nintendo Switch are included with a letter from Nintendo’s Reggie Fils-Aime, the president and chief operating officer of Nintendo of America. The future is now in your hands! Hardware launches represent special moments in time for us, and I imagine for you as well. They give us the opportunity to reflect on where we’ve been before taking a bold new step ahead. With previous hardware releases Nintendo has redefined how people play games. With Nintendo Switch, we’re not only addressing the “how,” but also the “when” and “where.” You’ve never been able to experience the power of a home console combined with the portability of a handheld before. When I tell you how enthusiastic I am about the lineup of games we have for Nintendo Switch, between launch day and the end of 2017, there’s no exaggeration. 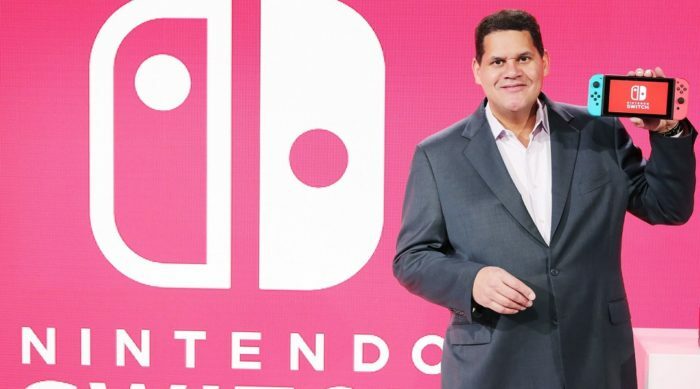 We’ve worked for a long time to get the pacing of our software releases just right, and that’s reflected in the fact that you will be playing a new Legend of Zelda game, a sequel to Splatoon, and a massive new Mario adventure before the year is up – not to mention the face-to-face fun of 1-2-Switch, the surprise that will come from new franchises like Snipperclips – Cut it out, together! Or ARMS, and the great content coming from our third-party partners. I could go on, but I’m sure you’re eager to get your Nintendo Switch out of the box and put it through its paces. I hope you enjoy the journey that we’re about to embark on together. Here’s to taking gaming in directions never before possible, all with Nintendo Switch. Thanks for your support. The Nintendo Switch will release globally next week on March 3 alongside 1-2-Switch and The Legend of Zelda: Breath of the Wild.